August was a good month for cheese, from recipes to reports on the American Cheese Society (ACS) conference in Montreal. 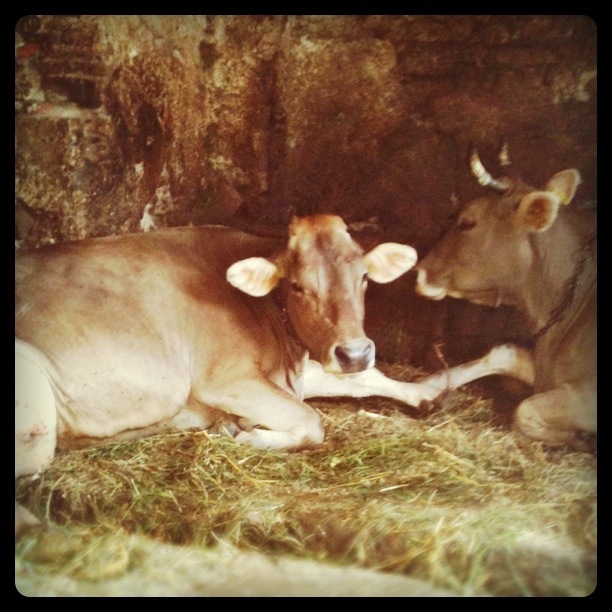 Greatly inspired by these, I submit to you my dairy montage from the blogosphere. If I missed any choice posts, drop me a line. Cookbookman examined the canned cheese, Cougar Gold. Kevin over at Closet Cooking waxed poetic about blue cheese guacamole. 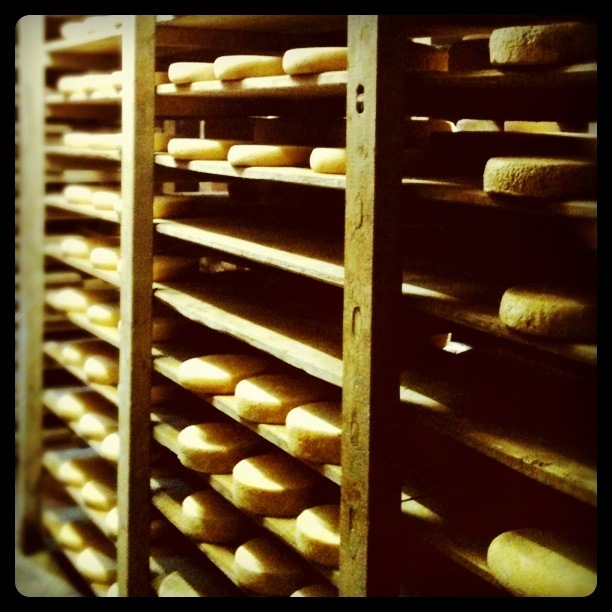 Maddie, a lit lovin' cheesemongeress at Artisanal, launched a cheese and poetry web. Alexandra Cooks concocted homemade ricotta pizza. AskChefDennis rocked the squash blossom with zucchini blossom cannoli. Janet Fletcher's column in The San Francisco Chronicle plugged new cheesemakers. The grrls at Cheese and Champagne offered an all-American goat cheese round-up. Cheese Underground highlighted new WI cheeses. At the sandwich blog, Grilled Cheese Social, MacKenzie fried a Bee Sting. In Montreal, Gordonzola captured cheese graffiti. And in case you missed it, cheesemonger Anne Saxelby made The New York Times. Off the cutting board, a cool new organization formed, Bloggers Without Borders. When you face blowing away, you want to be among friends. And so, last night, we invited the neighbors over for cheese in the face of Hurricane Irene. Just the day before, we’d driven out to Chester County, Monsieur Fromage and I, and we’d picked up some extraordinary wedges, so our larder was stocked with Sue Miller’s entire line of Birchrun Hills Farm cheeses. I couldn’t stand the thought of losing them all if the power went out and the fridge went dark. Luckily, my neighbors dig the funk. Here’s how the storm of cheese and Irene went down. 6:30 p.m. The rain hits. 7:00 p.m. Madame Fromage sets the table. 7:30 p.m. Cheese lovers dash across the street for nourishment. 8:00 p.m. There is windswept salad, plenty of beer. 10:00 p.m. Loved ones ring. There are phonecalls in the foyer. Midnight: I'm still thinking about Little Chardy, Sue's great Brie. 4:00 a.m. The chimney falls in. The ceiling snaps. 10 a.m. I’m blogging, feeling lucky to have a roof and good friends, but I'm also wondering about the cows I met at Sue's farm two days ago, like Little Chardy (below), the namesake cow who inspired the great Brie we all consumed at the height of the storm. Little Chardy, you still there? 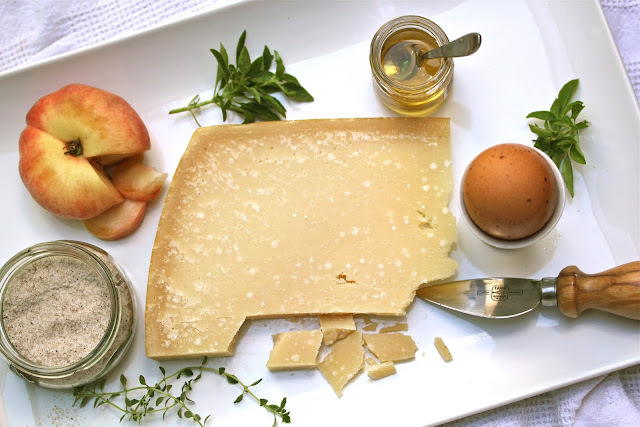 My post for Di Bruno Bros. this week is all about pairing Parmigiano. Until I was introduced to the authentic stuff -- the kind with tiny crystals and a gargantuan flavor spectrum -- I never found Parm that interesting. Click over to the Di Bruno blog to check out the 12 Parm pairings I put together. You'll never think of Parm as a "grating cheese" once you try some of these. Also, if you're curious about what's happening in the world of raw-milk legislation, listen to the program that Peter Crimmins put together for NewsWorks on WHYY in Philadelphia. Peter interviewed Al Renzi of Yellow Springs Farm, Emilio Mignucci of Di Bruno Bros., and yours truly. For the story, Peter actually came over to my house to sample two kinds of cheddar with me -- one pasteurized, the other unpasteurized. I chose two local cheddars (PA Noble and LeRaysville XXXX Sharp) that were aged approximately the same amount of time. Fascinating. You can hear his response here. Dreaming of fall? Join me for an evening of autumn flavors at Wedge+Fig, where Marisa McClellan (foodinjars.com) and I will teach you the pleasures of pairing cheese with homemade jam, pickles, and chutney, along with local brews. This is a great Cheese 101 for anyone interested in developing a palate, and if you’re a home canner you’ll leave with recipes you can use for parties and gift giving. Make a night of mixing and matching with six styles of cheese and plenty of accompaniments. We look forward to seeing you! For tickets, please visit Eventbrite. “It all comes back,” writes Joan Didion in her famous essay on the subject of writer’s notebooks. Now that summer is slippering away, I find myself flipping through pages of cheese notes on rainy afternoons. It's true. It does all come back. For almost three years now, I have recorded every nibble, every recommendation overheard at the cheese counter, along with lists of cheeses to try. Bad Axe. Gamonedo. (I have yet to find either.) But I will tell you this: it’s a pleasure to go back in time and relive first impressions – the first bite of Moses Sleeper, the first whiff of Comte: like nutty brown sugar – gorgeous, perfect, no ragged edge. So now that I am 3 dog-eared notebooks deep, allow me to nudge you, Lover of Cheeses, Dreamer of the Golden Dream. When you shop for school supplies, pick up a small notebook to carry in your sock or back pocket. Why? You can write down all your cheese desires. Then, when you go to the store and you can’t for-the-life-of-you recall whether you ate Boursin or Burrata at your cousin’s bat mitzvah, you’ll only have to flip open your little Bible. You can scribble notes at the cheese counter. Cheese counters should have scratch paper. The mongers always have great tips for pairings and sometimes tell scandalous stories that are worth recording for later histrionics. Won’t you be a clever fly on the wall with your new Moleskine? You will develop a glittering palate. Cheese can seem daunting, but if you begin to describe flavors on paper you’ll begin to recognize certain qualities that reappear – like grassiness or peanutty tastes. Soon, you’ll see that these flavors are distinct to certain cheese styles. You can read aloud from your cheese notebook at poetry readings. Let me give you an example: Tuma Di Fobello, smells meat lockery and ripe. Looks vaguely leopard print. A real fly magnet. You’ll make fabulous friends. A cheese notebook leads to tastings. Tastings lead to cheese parties. Cheese parties draw Europeans. Europeans bring great cheese, and the beastly cycle continues. Best of all, you can tell others that you are writing a memoir. Some people need a farm in Africa. Others need sad divorces in order to eat, pray, love. A good cheese is all the journey you need. Let’s remember that. Say it after me. Now write it down. My go-to summer appetizer has become a singular obsession. It’s simple: Mascarpone, speck, and sliced peaches. Put this on toasted baguette rounds, and you’ve created the last rays of summer. Each time I make these for a party, I tweak them a little. I add a few cranks of pepper or some tiny nodes of flowering basil. The minute I set them on a table, they vanish and itty bitty taste-gasms ensue. The key is good Mascarpone. I’ve experimented with different brands and I have to say that, although it’s cheeky expensive (as much as $8.99 for a wee tub), the BelGioiosi brand boots the Whole Foods brand ($2.99). The latter is silken but virtually tasteless, whereas BelGioioso is sweetly milky. If you’ve never tried Mascarpone, prepare to wallow. It’s like Nutella’s blonde cousin – you’ll want to slather it on bread and then fall, panting, onto the couch. It’s great with jam, and it’s got half the calories of butter – as if you care. If you’ve never met speck (pronounced shpeck), you’re really in for a breathless moment. Imagine Prosciutto’s suave brother – a slightly smoky character from the Alto Adige region of northern Italy. It’s less salty and more nuanced than Prosciutto. Enough naughty talk. Go to the store. If you have leftover Mascarpone, you might want to make anchovy toasts. They're my favorite thing to make on New Years Eve with Champagne. 2. Thinly slice baguette into rounds and drizzle with olive oil. Bake on a cookie sheet until brown, flipping once. 3. While baguette rounds cool, slice peaches and toss with a little olive oil and a few cranks of pepper – this will keep them from drying out. 4. Shmear baguette rounds with Mascarpone. Add a layer of speck, a peach slice, and top with chopped fresh basil. I am not the sort of person who can walk by a cheese shop without going in. That’s what led me through a red door to discover the perfect sandwich: Quickes Cheddar, Marmite, avocado, and watercress pressed into a crusty baguette. At Wedge and Fig, a new cheese shop and cafe in Philadelphia's Old City, this is called The Ex-Pat. It could also be called The Diary of Mary Quicke, after the British cheesemaker who makes this gorgeous clothbound cheese on her family's 450-year-old farm and blogs about it. At Wedge and Fig, the cheese sandwich has been redazzled. Consider The Blue Fig, a shmear of Fourme D’Ambert with fig spread and prosciutto on pretzel bread. Then there’s The Betty Draper – truffled egg salad (no cheese) and coins of thinly shaved cuke, served with a side of candy cigarettes. Wedge and Fig impresses me as the sort of shop that mixes all the right vibes: it’s a little bit Left Bank -- think artists, streams of sunlight, a cafe garden bordered by fire escapes -- and a little bit lipstick. You’re just as likely to see a shop girl carrying a dog in her purse as you are to see a hipster with a drawing tablet. The staff knows and loves its cheese. The front case keeps clear of deli ruckus – thank gawd – to keep the focus on interesting beauties: from gooey Pont l'Eveque to my favorite toasty Gouda, Old Amsterdam. A wildly large wedge of Quickes Cheddar lives front and center. To encourage cheese and lounging, the café stays open late on Fridays and Saturdays (until 8 p.m.) to serve custom cheese boards. Bring in a bottle of wine, and you can have a cheese plate made to match. It's served on a slate with chalk-drawn arrows to show you the order in which to eat each selection. Desserts made by Rebecca Torpie (above, right), formerly of Flying Monkey Bakery, should not be skipped, in particular her tuffet of goat cheesecake topped with caramel. And don't forget to check out the back garden -- down a dark alley just to the left of the shop. The life of every cheese blogger is full of nibbles and pursuit. Pursuit of knowledge. Pursuit of the next delicious bite. Camping out in Montreal amid scores of cheesemakers and cheesemongers as part of last week’s American Cheese Society conference filled the belly and the brain. I hardly know where to start in describing the myriad delicacies and factoid tidbits. In a sentence: I am still full. Here are the unforgettable insights from a 4-day binge on North American cheeses and the men and women who make, sell, coddle, and sniff them. Most aging rooms house cheese mites – tiny, near-miniscule creatures that feast on the rinds of hard cheeses especially. In a presentation by the cheese nun, we saw them munching like calves on grass, under a microscope. If you have a cheese mite problem, consider getting an ozone machine. One gentleman who shall remain unnamed found that this sterilized the mites and prevented them from reproducing. This is the French way of pronouncing what cheese curds do when you eat them. Following hipster trends, popular cheese names are derived from fowl. Gray Owl. Birdville Reserve. Hummingbird. More blue cheese is made in America than in France, the birthplace of Roquefort. So says Will Studd, a man who held a public funeral for Roquefort in Australia when the country banned raw-milk cheese. The reason Beecher’s clothbound cheddar tastes so freaking good, my luvs? The wheels are rubbed down with melted better. I also learned why Beecher’s never uses the word “cheddar” in their packaging: the recipe contains cultures also used in Gruyere and Ementaler. It’s a beautiful, butter-lathered hybrid. No surprise, this French-speaking region produces 350 varieties of cheese and is the original home to the first dairy school in North America (founded in 1889). I sampled a gorgeous cheese plate at Accords Wine Bar in Old Montreal where the cheeses were served so beautifully. Voila! My favorite was Riopelle. Did you know that you are born with 10,000 tastebuds? By old age, you only have 4,000 left. I learned this at a flavor session with Christine Chénard, a taste specialist from Cintech. Will Studd predicts a raw-milk ban for the U.S. similar to the one Australia and New Zealand adopted in 1996 (N.Z. reversed it eventually). Ann Colonna, a researcher from Oregon State University, who has been studying the issue shared evidence that 95% of Americans are not in favor the ban, and 60% said they wanted to see the 60-day rule relaxed. Judges at the American Cheese Society tasted over 1600 cheeses to select a North American grand champion. I’m happy to report it’s one of my faves, too: Rogue River Blue. Got get a wedge before it's gone. It's great with barley wine (try Blithering Idiot from Weyerbacher). To check out my post about ACS for Di Bruno Bros., please click here. This week, I’m in dairy paradise. Madame F’s in Montreal, ya’ll, hanging out at Cheese Con, otherwise known as the American Cheese Society (ACS) Conference. For the last three years, I’ve dreamed of attending North America’s greatest cheese party. Now here I am, one of more than 800 cheese geeks, dashing between lectures on starter cultures to tastings of ice wine. Wondering what kind of crowd shows up at a cheese conference? Here’s an overview. First, there’s the cheese nun. Sister Noella Marcellino is this year's scholar-in-residence. She meets one on one with cheesemakers to study their rinds and identify lurky bacteria. Yesterday morning she met with Sue Miller, from P.A. to explain some funky specks. The bacteria that Sister pulled up on her computer screen was surprisingly beautiful (like stained glass), but we learned not to get attached – it makes a rind smell like ammonia. Then there are cheese judges, like Mary Quicke of Quickes Cheddar. She’s been in Montreal since Monday, sampling upwards of 50 cheeses per day. When the cheese Oscars are announced tomorrow night, she’ll be there, alongside a slew of other super tasters who dictate the future of artisanal cheese. This year’s convention has brought out the cheddar heavies. After breakfasting with Mary Quicke, I sat across from the makers of Avonlea, a wonderful clothbound cheddar made on Prince Edward Island. We talked Fiscalini (a great cheddar from California) and looked around the room for the folks from Cabot and Grafton, both from Vermont. New cheesemakers are on the scene, like this adorable pair from Traderspoint Creamery in Zionsville, Indiana who are here to debut their slow-process, grass-fed cottage cheese. I don’t have a soft spot for cottage cheese, but this stuff is wonderful – like pillows floating in cream. Farmers are here. Every evening, there’s a “Meet the Cheesemaker” party where milkers and makers set out wheels, and attendees flock around like pigeons, gaping and squawking. Everyone’s sniffing out the funkiest, wildest, most dewy new cheeses – you see guys in Murrays T-shirts wrangling accounts and Whole Foods reps whipping out their biz cards. There are also authors. And loads of volunteers. And organizers. Somewhere in the mix, there are a few of us lingering on the industry’s periphery. We’re here to take it in and tweet it out. But mostly, we’re here to nibble and eavesdrop and walk in awe behind some of the most talented dairy professionals in the business. It’s the trip – and the tasting – of a lifetime. My friend Stephanie Patrizio quit her job to spend the summer in Florence, learning Italian. When she told me of her plans, I cheered her on and asked her to send me periodic cheese reports. Below is Stephanie’s latest cheese adventure. Oh, how I love having a foreign correspondent. Living in the beautiful city of Florence, one is exposed to some of the most beautiful art and sculpture in the world. The Duomo, the David or the Arno at sunset would take anyone’s breath away. But for me, the most exhilarating moment was when I walked into a 500-year-old cellar filled with beautiful homemade Italian cheeses, just outside of Bergamo. My friend, Julia, has been living in the charming town of Villa d’Ogna for about 2 years, although her family has lived there for generations. 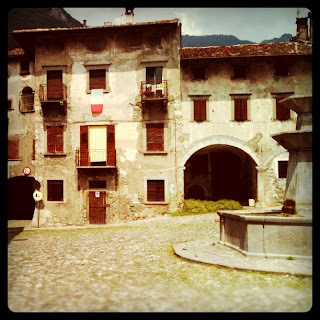 To get away from the busy streets of Florence, I traveled to Lombardy to visit her. Julia and I bonded years ago with our love for our Italian heritage and, of course, cheese. So when she told me that she was bringing me to a place she called ‘the cheese vault,’ I was more than a little excited. The moment I stepped in front of Franco’s house, I knew this was going to be a unique experience. 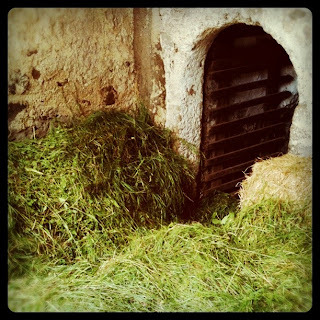 The cows were relaxing in the shade, the fresh grasses they ate were piled on the doorstep, and when I asked Julia, ‘What do we do now?’ she simply said, ‘We ring the doorbell!’ Her boyfriend, Marco, a man who is the true definition of Bergamasco, came as our translator since Franco’s dialect is so thick. Months of Italian courses couldn’t help us now. Franco appeared in a window, fresh out of the shower. I expected him to send us away, but this was apparently part of his daily life. He came downstairs and led us to a small wooden door next to the cows. This is when I really started to get butterflies. When he opened the door and led us inside, my mouth dropped. A cold breeze hit my face as I stepped into the dark cellar exposing hundreds of wheels of cheese lining the walls. Young cheeses, old cheeses, cheeses made from sheep, cow and goat. Being only a cheese lover rather than a true enthusiast, I suddenly wished I had enough knowledge to know exactly what was in that cellar. There was an enormous scale in the corner, a small working desk surrounded by shelves of cheese (where can I get one of those, West Elm? ), and an old gorgeous slicer. There was too much to look at, and I could tell there was never going to be enough time. This was Franco’s job, not a tourist attraction, so I smiled and hoped the excitement in my eyes would help all the sneaky picture taking. He cut a fresh wheel and asked me to try a cheese called ‘Formaggio di Monte’ (cheese of the mountain), made by Franco himself only 4 months earlier from the cows who were right outside the door. He sliced a piece the way any proper Italian man slices anything, using the knife to meet his thumb. Its perfectly salty fresh goodness melted in my mouth. All I could get out was a nod. I bought almost a quarter wheel for 5 euro, knowing anywhere else in the world it would be more than double the price. Franco became a movie star to me and I became a blubbering idiot in the face of stardom. I’ve known how to say ‘what is your name?’ for years but all I could get out was ‘tu…. chiama….’ I said grazie what felt like 50 times and went back out into the daylight. It was afterwards, after a feeling of having 4 espresso, I asked Marco for the details. If this is the cheese vault, then Franco is the cheese keeper. He cares for the cheese for all the makers of the nearby mountains. He cares for them, wipes the mold from them daily, keeps them in the right temperature, and makes and sells his own on the side. He is an old man, with no heirs, so one day when he dies, the cheese vault will die too. Knowing this made my experience even more special, hoping that trades like this will never disappear. I carried the cheese in my purse all the way back to Florence and placed it in the fridge. The next day I broke off a chunk for my local cheesemonger (any respectful Italian woman has one of those) and asked for advice on pairings. Upon instruction, I let the cheese sit for 2 hours, bought some fresh bread and prosciutto from the market, and waited anxiously. I always enjoy trying cheese first by itself, to capture each moment of flavor. I suppose the phrase ‘the cheese stands alone’ has a different meaning with a more refined palette. When the cheese was ready, I made a simple plate. It was just as delicious as the moment I tasted it in the vault. It was soft, mild, and milky, and then it kicked you in the tongue at the end. The salty ham for a chaser was more than perfect. Check out Stephanie Patrizio's daily photo blog, Sono Stefania.